Many Crook hybrid guitars start out the same way. Players aren’t sure what they want, they just know what they have isn’t quite cutting it. A hybrid isn’t just about focusing on one feature. The guitar comes about because a customer is looking for the right feel and a particular sound they haven’t been able to find in one guitar. That means before the customer and I decide on any elements, I listen closely to the desires first. That’s how the Cherry Sunburst Double Cutaway hybrid came to be. 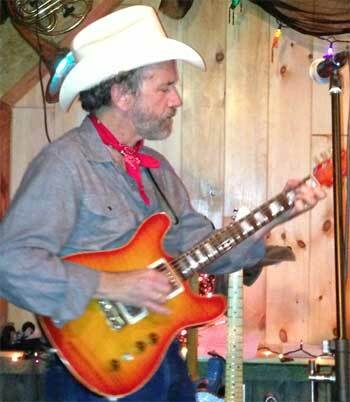 After talking to the player, I learned that he wanted a shape that would give a sentimental nod to his first guitar, an early 60s Gibson ES-335, and he was looking for that fat warm Humbucker sound for blues and jazz songs. On the other hand, he liked the 25.5” scale length, fat neck and fret wire of a T-style guitar I had built for him. And, he wanted a smaller body size than the 335. Soundwise, he also wanted plenty of clarity to avoid a muddy bottom end. We chose a double cutaway T-style body reminiscent of the 335. I chose mahogany wood with a solid center block and hollow sides. The mahogany would help to emphasize the midrange of the guitar to give it a fatter sound but keep it clear and defined. 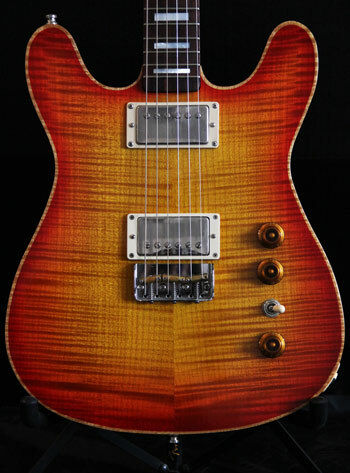 I capped the body with a flame maple top and finished it in a cherry sunburst and a matching headstock. Keeping with the 335 vibe, I used a mahogany neck with a rosewood fingerboard to add a bit of warmth, and I topped it off with custom inlays. With the brightness of a longer scale neck, it would make a big difference on keeping the low-end sound nice and tight, especially at the neck position, which can be a big problem on 24.75” scale guitars. There’s more to sound than just scale length, so I turned to Peter Florence of Voodoo Pickups for a custom wound set of his PAF’s. I could have used a Gibson-style bridge, but I chose a T-style half-bridge to get more clarity and more attack on the note. The Double Cutaway turned out great and covers the “Gibsony” sound he wanted, whether he is playing a fingerstyle jazz solo or a screaming slide guitar solo. I’ve seen him play the guitar live many times, switching comfortably between it and his T-style during a set. The beauty of a hybrid is the beauty of any custom guitar—you can get what you want. I truly enjoy making hybrids for players because they get a guitar that achieves what they are looking for, and I get the opportunity to do something a little outside the box. Brad’s Non-Reverse Telebird is a good hybrid example, and we both loved the results. Call me with your sound and feel vision, and let’s talk it out! This entry was posted in Story Behind the Guitar and tagged bodies, neck, pickups, T-Style, wood. Bookmark the permalink.